Jane Hirshfield, who published her seventh book of poems, Come, Thief (Knopf), last year, joins our continuing series of guest blog posts by writers of fiction, poetry, essays, and history with this appreciation of the life and work of Czesław Miłosz, whose Selected and Last Poems: 1931–2004 Ecco Press published in 2011. I reach eighty, I fly from San Francisco to Frankfurt and Rome, a passenger who once travelled three days by horse carriage from Szetejnie to Wilno. Between those two poems, a changed life. Between those two poems, a changed world. I pray to my bedside god. For He must have billions of ears. And one ear He keeps always open to me. For four of his nine decades, what was local, intimate, and at-hand to Czesław Miłosz was California and his Tudor-style storybook cottage on Grizzly Peak. One prose book is titled Visions from San Francisco Bay—his daily view. And so, because it is biographically true, and because he was a poet of the podręczny—of what is near to the hand—this poet of the Grand Duchy of Lithuania and Poland was nonetheless a poet of whom we might say also: of California. Some facts. Born in 1911, Miłosz spent his youth in the forests and farmlands of Szetejnie, Lithuania, a member of a Polish-speaking landholding family in a place where historical borders had long been fluid. He died in Krakow, Poland, at age 93, in 2004. In between, he attended university in Vilnius, traveled to Paris in the 1930s, watched as a member of the Polish resistance during the Second World War first the destruction of the Warsaw ghetto, and then of the larger city. He came to America first as a postwar diplomat serving the Washington D.C. embassy. After he defected, first leading the life of an émigré writer in Paris, he found a home in America, teaching in relative obscurity in the Slavic Languages Department of the University of California, Berkeley—until the Nobel Prize in 1980 procured him both that rarest of perks, a personal parking place on the Berkeley campus, and fame. Miłosz was fluent in Polish, French, and English, learned Lithuanian, Russian, and some Yiddish in childhood, traveled widely (mushroom hunting in forests wherever he could). He served as ambassador between the world's literary traditions, including in his anthology A Book of Luminous Things translations of poems from Europe, Asia, North and South America, Scandinavia, and the Near East. The word “cosmopolitan” has many definitions. Some speak of the cosmopolitan as “free from local, provincial, or nationalist ideas or prejudices”; others say simply “belonging to, at home in, all the world.” For naturalists, the word means “globally at home”—humans, then, must be, along with ants and termites, a biologically cosmopolitan species. We don’t ordinarily think of the cosmopolitan in terms of Walt Whitman’s “kosmos,” yet it seems here somehow apt. Walt Whitman was the one poet Miłosz praised entirely without demurral. Each was a poet of breadth-embrace and a seemingly omnivorous appetite for the detailed actual. You can see the slip-hem of this in the way Whitman cannot speak of himself as “kosmos” without naming himself simultaneously a poet of particular place: “Walt Whitman, an American, one of the roughs, a kosmos.” “Walt Whitman, a cosmos, of Manhattan the son.” In these couplings is the same balance of large and local we find in Miłosz’s bedside god. Each time Whitman names himself universally capacious, he cannot seem to help issuing also a Morse Code tap on specific ground. Perhaps I am trying to sketch here a premise too complicated for such a brief form as this virtual Library bookshelf. But Miłosz, a poet of almost incalculable range, continually reminds us also that poems, and poets, live in the small, in the local and comic recognition, in the living and perishing real. We do not, cannot, live in general; even exile takes place in a place, a deck overlooking a Bay, on which a poet with extravagant eyebrows turns the pages of a New Yorker for its cartoons. We breathe the air that is near to us, scented with redwoods and lemons, or with the exhaust of refineries, power plants, airplanes, wars. If a poet in exile continues writing, he or she will be sustained by that air and that place, and will become of it. Let me close then with a poem by Czesław Miłosz scented with the smoke of California's cedars, which holds in its stanzas each of the places of affection here seen: Berkeley; Poland; his “place” among persons of letters, with both the hope of lasting and the acceptance of disappearance. Even the afterlife is landscape: mountainous, physical, wooded and ridged. This poem holds also history, politics, the devastation of the Second World War, the contemplation of aging and death. It breaks into almost incoherent fracture, an “omnium gatherum of chaos,” and feels its way back by effort of thought; Miłosz’s moral universe is always recalibrated by a self-judgment more severe than his judging of others. And then: the poem’s late shift into the altering “you” of direct address—for me, among the most moving and intimate gestures of all twentieth-century poems—in which Miłosz declares an abiding faithfulness to the place of his truest terrestrial citizenship: the multitudinous, flickering, humanly known, and altering earth he will leave. Grayness and rosiness, an almost transparent full moon. I add logs to the fire, I drink and I ponder. Though they had many virtues I couldn’t touch. Yet embarrassed by the clearness of the view. The ashes of inconceivable arts. I passed judgment on that. Though marked myself. This hasn’t been the age for the righteous and the decent. And to recognize in them myself. You, moon, You, Aleksander, fire of cedar logs. Waters close over us, a name lasts but an instant. Not important whether the generations hold us in memory. When the sun rises beyond the borderlands of death. Where, beyond every essence, a new essence waits. By a sound and a color which are more and more perfect. Do not die out, fire. Enter my dreams, love. Be young forever, seasons of the earth. All of the poems cited in this post appear in Czesław Miłosz: Selected and Last Poems: 1931-2004 and are used with permission from Ecco Press. Jane Hirshfield contributed a remembrance of Miłosz to the book, An Invisible Rope: Portraits of Czesław Miłosz (2011). 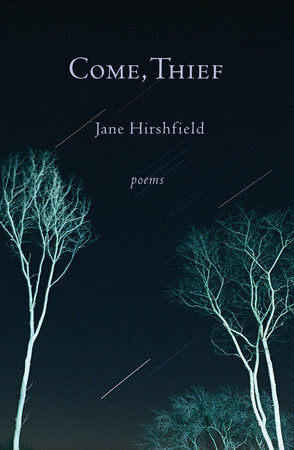 Miłosz once wrote about her work: “A profound empathy for the suffering of all living beings—it is precisely this I praise in the poetry of Jane Hirshfield. . . . In its highly sensuous detail, her poetry illuminates the Buddhist virtue of mindfulness. She is among the most outstanding of my fraternity of California poets.” Reviewing Come, Thief in The Washington Post, Steven Ratiner observed, “Hirshfield’s verse involves a deepening attention to every aspect of human experience, from the dailiness of our lives to the most ineffable moments.” Dwight Garner cited her Kindle Single, The Heart of Haiku (2011), as “so good” it awakens you to “what feels like the promise of a new genre.” About Nine Gates: Entering the Mind of Poetry (1998), Gary Snyder wrote, “These expansive, fearless essays are on the basics of—not poesy in any small sense—but mind, wit, stalking, silky focus, the eros of knowledge, the steely etiquette of art.” In 2012, Hirshfield was elected a Chancellor of The Academy of American Poets. Wonderful post! Two marvelous poets.